A soft workout for the body for stronger muscles and improved posture! Good posture helps eliminate back pain, prevents injuries, improves balance, coordination and blood circulation. In private, semi-private or small groups, our certified instructors offer you personalized and safe supervision so that you can enjoy all the benefits. Recommended by health professionals to regain your mobility after a surgery or an injury. A 55-minute session performed on the Reformer which focuses on the basic principles of Pilates: improving posture, strength, flexibility, control and breathing. Helps to reduce back pain, tension in the shoulders and neck. Different accessories (balls, fitness circle, elastic bands) are also added to your session for more fun and intensity. 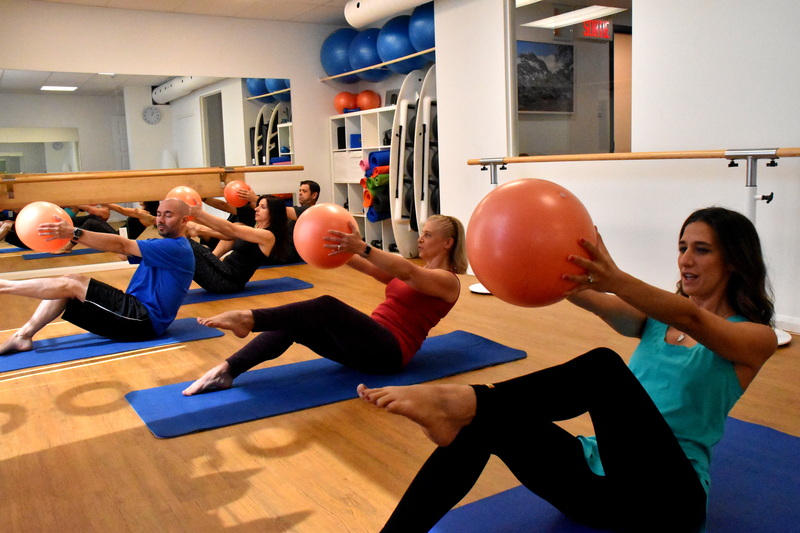 A 50-minute session focused on the basic principles of Pilates: improving posture, strength, flexibility, control and breathing. Helps to reduce back pain, tension in the shoulders and neck. A series of exercises performed standing, sitting or lying down on a mat. The session begins with a gentle warm up of your spine and a few deep breaths to better focus on your body followed with a variety of exercises to strengthen your abs, your back, arms and legs.